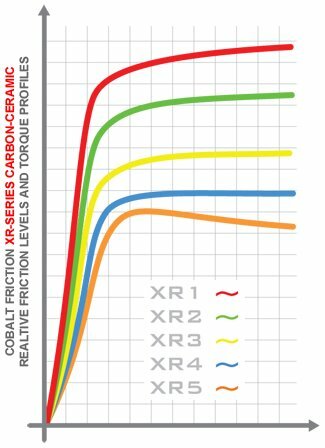 Cobalt XR3 is a versatile, medium-high torque material with a solid initial bite and a slightly rising torque curve. Unsurpassed cold performance, torque stability, consistency and modulation/release for this level of friction make the XR3 an ideal compound for Club Racing and Track Day/HPDE customers, particular in moderate to lower inertia vehicles. Also recommended for rear-axle use on vehicles over 2800lbs, delivering optimal straight-line braking performance, stability and controlled rotation while trailbraking.